We hold three vigils a week throughout the year. We encourage everyone to bring a camera and share the footage you take with your friends and family. Please join our “Toronto Pig Save weekly vigils to bear witness” events page on Facebook. If you are not on FB please email us at torontopigsave@gmail.com and we’ll add you to our weekly email list. Visit our YouTube and Vimeo channels for footage of our vigils. We hold at least one weekly vigil at “St. Helen’s” and “Ryding-Regency Meat Packers” cow slaughterhouse, at 1 Glen Scarlett Road, one block northwest of St. Clair and Keele, followed by a vigil at Maple Leaf “Poultry” at 100 Ethel Street. Vigils are also held at Fearman’s pig slaughterhouse in Burlington and other slaughterhouses in the GTA/Golden Horeshoe area. 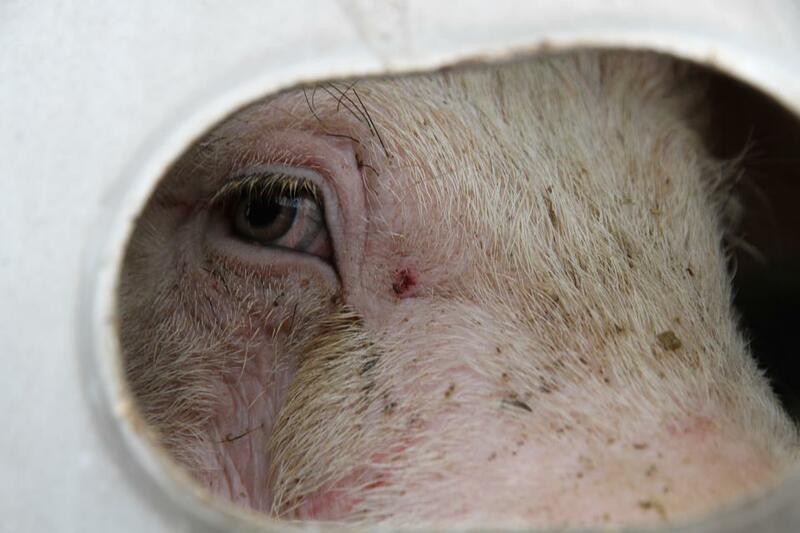 Photo of a sad and frightened pig taken at a Toronto Pig Save vigil in 2012. Download our observation sheet which details any possible violations of animal cruelty laws and codes.